100 ml, 1 l plastic bottle, 5 l cans. High-effective combined broad-spectrum antibacterial drug against diseases in pigs and poultry. Oral dosage form is convenient for group administration. Long-term absence of microorganism tolerance. 100 ml contain enrofloxacin - 10 g and colistin sulfate - 100,000,000 IU as active ingredients. Combination of enrofloxacin and colistin sulfate has synergistic effect providing broad-spectrum antimicrobial activity against gram-positive and gram-negative microorganisms. Enrofloxacin (a fluroquinolone compound) is active against Escherichia coli, Haemophilus spp., Pasteurella spp., Salmonella spp., Staphylococcus spp., Streptococcus spp., Clostridium perfringens, Bordetella spp., Campylobacter spp., Corynebacterium pyogenes, Pseudomonas aeruginosa and Mycoplasma spp. Colistin sulfate (a polypeptide antibiotic) is active against Escherichia coli, Pseudomonas aeruginosa, Klebsiella spp., Salmonella spp., Proteus spp. After oral administration enrofloxacin well and rapidly absorbs in gastrointestinal tract penetrating within most of organs and tissues; colistin sulfate slightly absorbs in gastrointestinal tract and does not accumulate in organs and tissues. Mainly, it is excreted unchanged in feces. 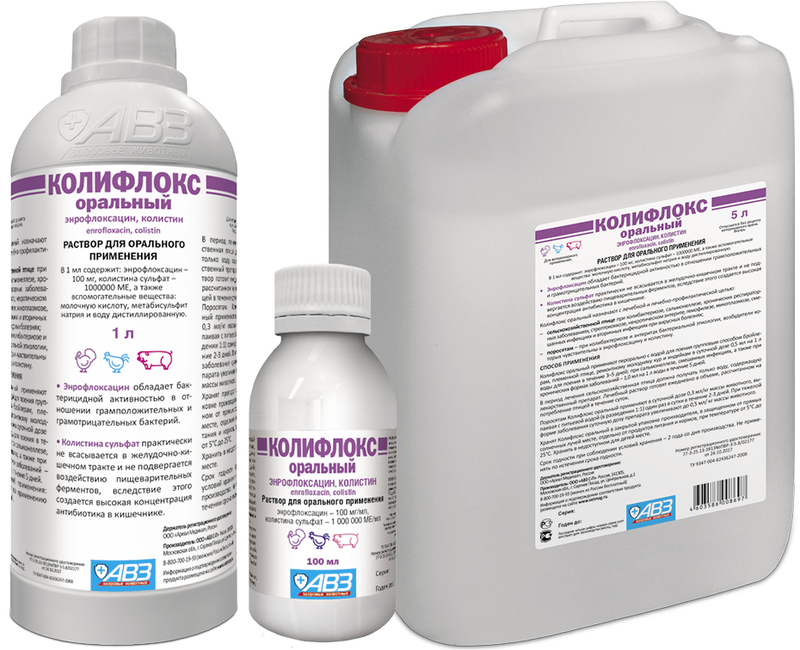 Use to treat and prevent poultry with colibacillosis, salmonellosis, chronic respiratory diseases, streptococcosis, necrotic enteritis, Glasser's disease, mycoplasmosis, combined infections and secondary ones associated with viral diseases; piglets with colibacillosis and bacterial enteritis, agents of which are susceptible to enrofloxacin and colistin. It is not recommended to use in laying hens and henny replacements 2 weeks before start of egg-laying (due to enrofloxacin accumulation in eggs). 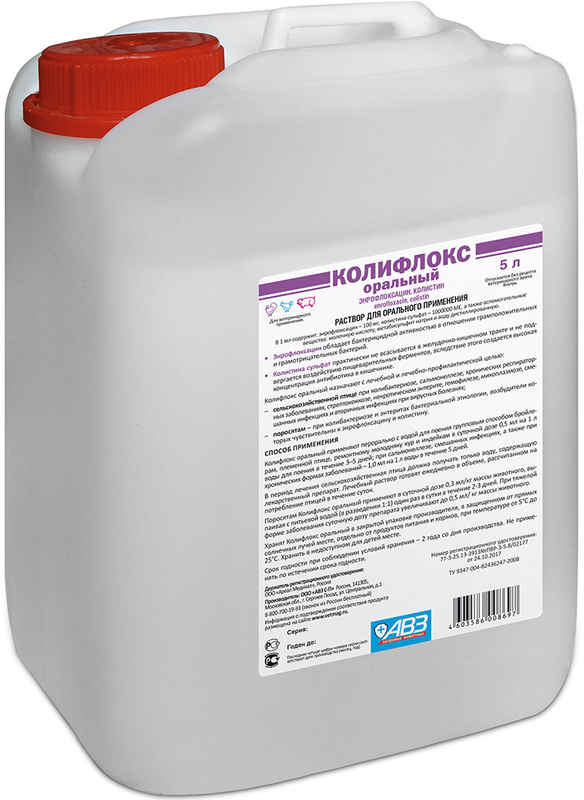 Do not use in piglets < 20 kg and animals with renal and hepatic diseases, as well as in combination with levomycetin, macrolides, tetracyclines, theophyllin, polyether ionophores, nonsteroidal anti-inflammatory drugs and magnesium and calcium supplements. Broiler chickens, breeding poultry, replacements of hens and turkeys: administer by rearing in daily dose of 0.5 ml per 1 l of drinking water within 3-5 days; salmonellosis, combined infections and chronic diseases - 1 ml per 1 l of water for at least 5 days. Only water with the drug is allowed to be consumed during treatment. Piglets: administer by rearing with potable water (1:1), daily dose is 0.3 ml/kg of body weight, once a day within 2-3 days. In case of increased individual sensitivity to active ingredients, feed refusal, vomiting and motor dysfunction may be observed. In case of adverse events, stop drug administration. Poultry and piglets are allowed to be slaughtered for meat in 11 and 14 days, respectively, after the last drug administration. Meat of compulsorily slaughtered animals received before stated period termination can be used to feed animals or reworked to tankage. Store in original package at 5-25°С. Protect from direct sunlight and moisture. 1 l plastic bottle, 2.5 and 5 l cans.